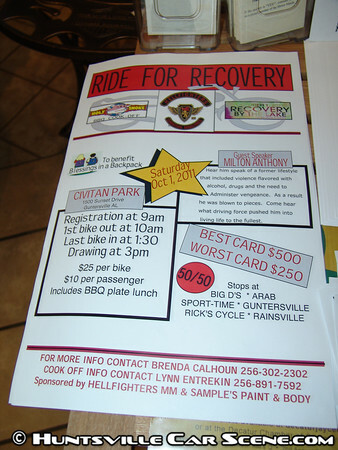 Registration is $25 per bike and $10 per passenger and includes a BBQ plate lunch. Stops include Big D's in Arab, Sport-Time in Guntersville, and Rick's Cycle in Rainsville. Awards for best card of $500 and worst card $250. There's also a 50/50 drawing. Proceeds to benefit Blessings in a Backpack.